The exterior of this dashing RV features a 15' 0" awning, providing some much-needed shade and protection from the elements! 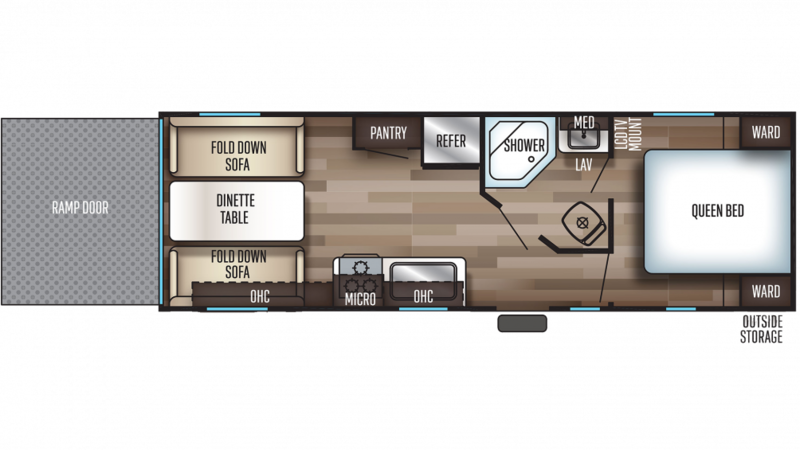 You can go further with this RV, which boasts a GVWR of 7686 lbs, a hitch weight of 686 lbs, and a ship weight of 4871 lbs! Bring all your gear with you on your RV outings. This Grey Wolf has 2815 lbs. of cargo capacity, plenty for all your toys and equipment! Bikes, ATVs - they'll fit nicely in the 12' 9" garage that comes with this Toy Hauler.